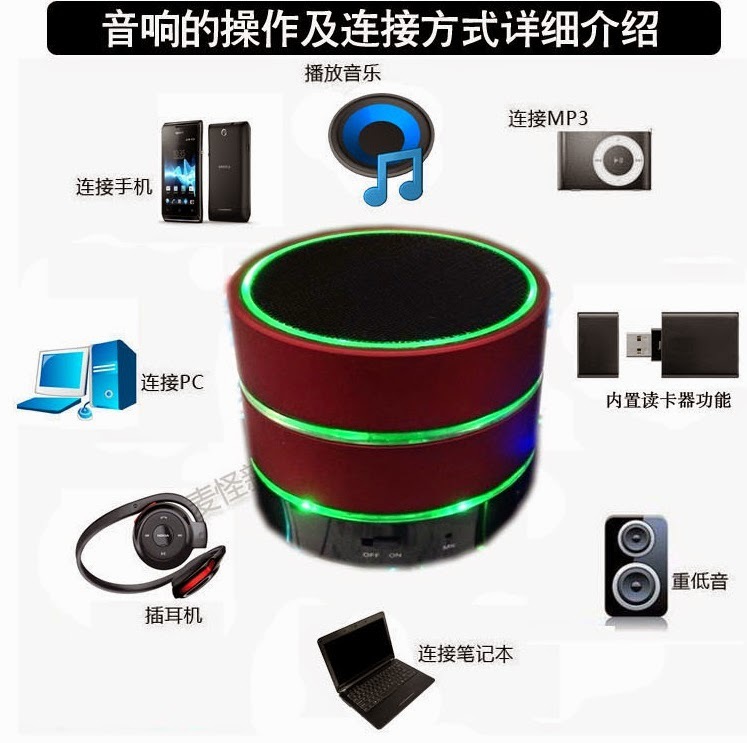 1) Small stereo Bluetooth support any mobile phone or tablet device with Bluetooth wireless connectivity, the new speaker with 2 in 1 cable (USB charging and 3.5 audio connector to a computer or mobile phone). Convenient and simple, Recommend! 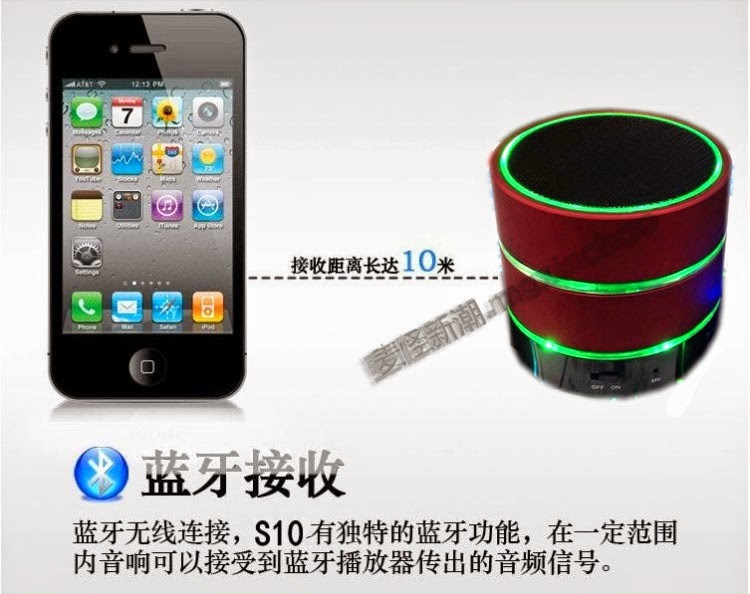 2) It is a small size speaker with 500 mA lithium battery. Bluetooth connection consume more power, moderate volume can play for about 2 hours. cable connection or TF card can play for 3 hours. 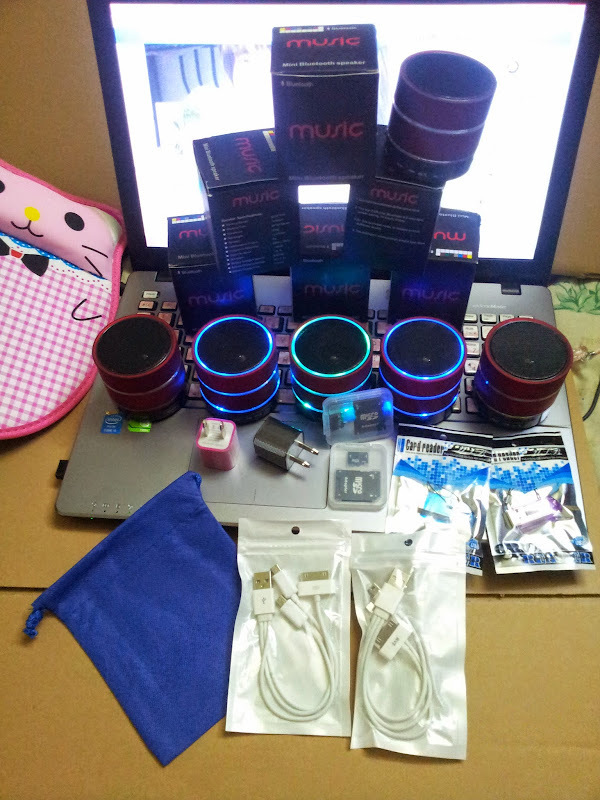 The higher volume of sound u play, the more battery is consume. 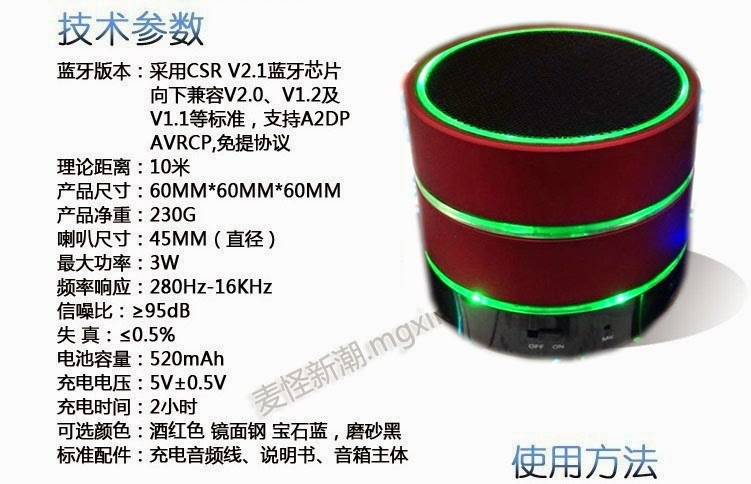 3) This speaker has radio function, but the radio signal at indoor building is not strong, it sounds "zzzzzz zzzz" when it cannot receive the radio signal and radio channel. It must be placed at site that have strong radio signal in order to receive the radio channel. 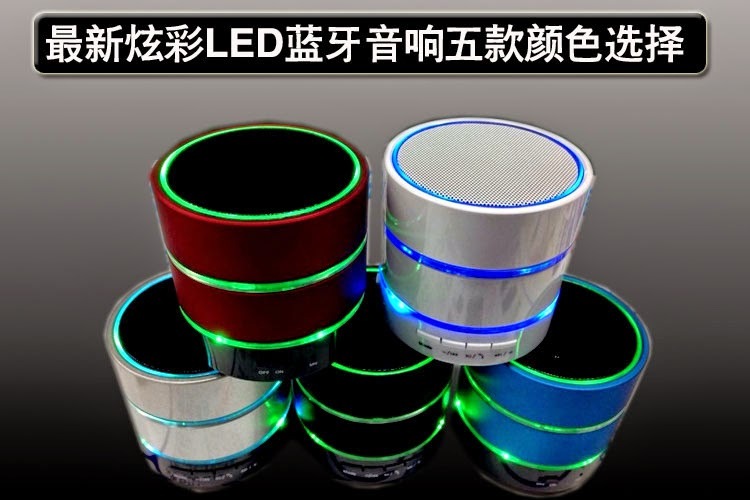 4）The light emitting and non-emitting function exactly the same, the configuration is the same, but it is added the LED light ring, it can be turn off and turn on the light mode can be adjusted according to user's personal preferences. 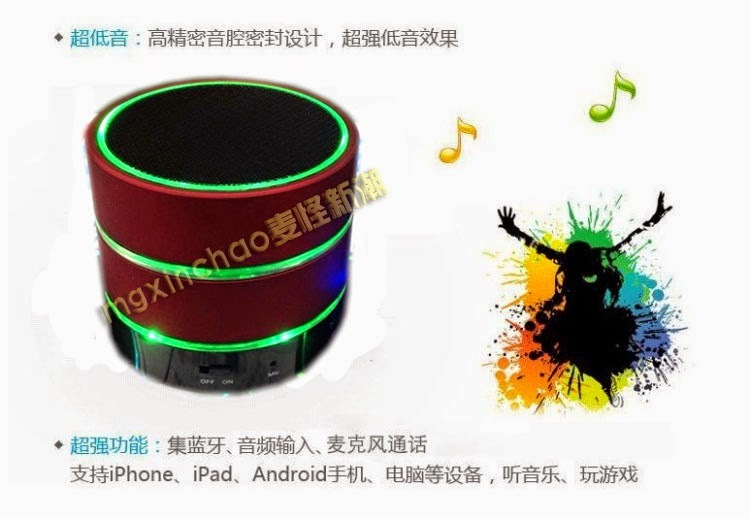 Stainless steel speaker net, high quality sound and clear and loud sound, stylish appearance. 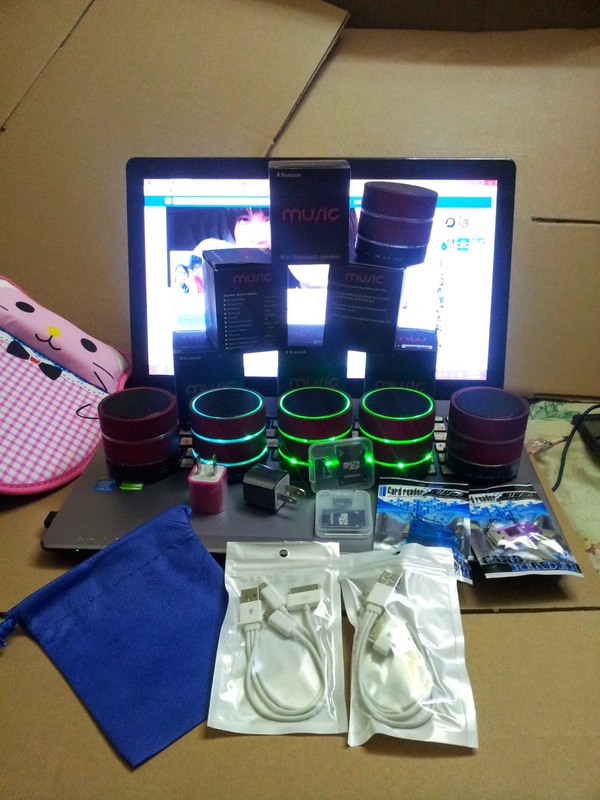 The set include : box + manual booklet + speaker charger cable + electric plug head + 8gb memory card + usb card reader + multiple connector usb cable. 100% no radiation suitable for playing music to baby. play music to comfort and relax. 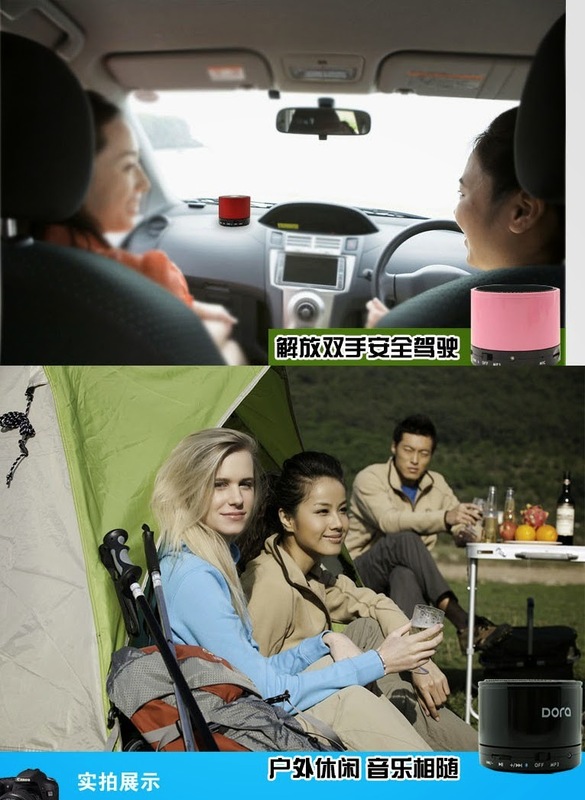 Don't need to use hand for phone call when driving car for safety purpose. Music follow everywhere while entertaining at outside. The speaker is made by the greatest work, high quality sound is where it come. 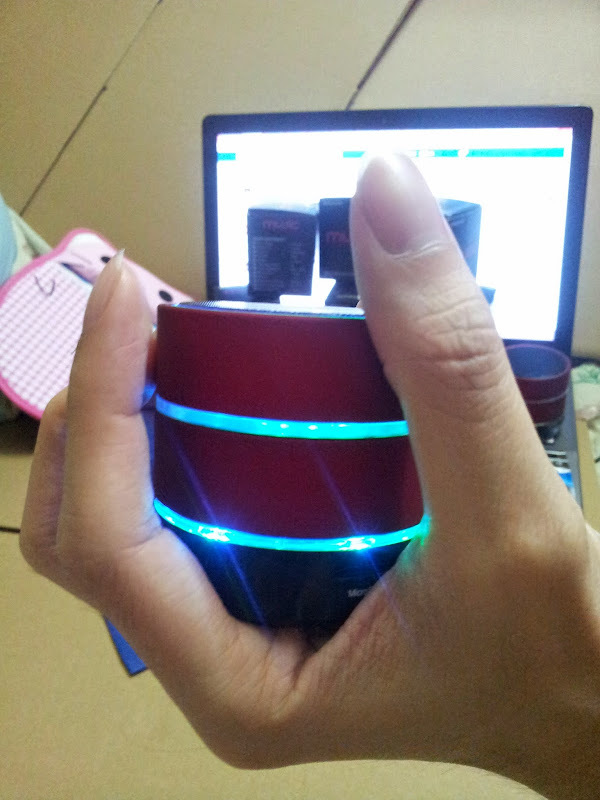 The speaker is the small size, easy to carry it anywhere. 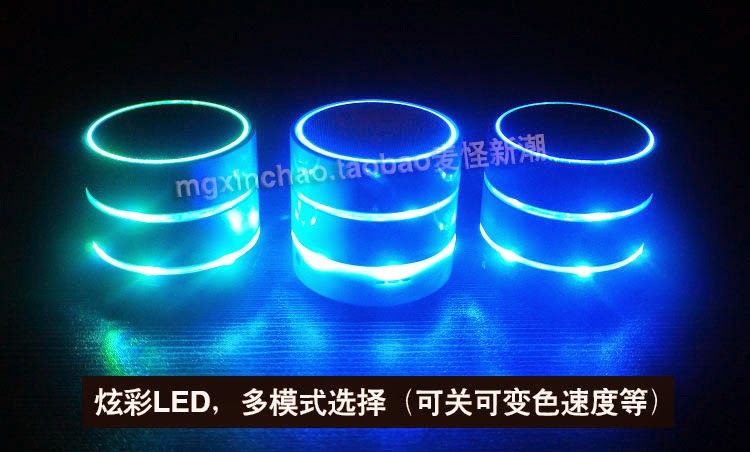 Three rings of colorful LED light. The greatest work and high quality of stainless steel. There are 5 different colors : red, gray, blue, black and white. Please ask the seller whether or not got stock for the color that you prefer before you buy it. Powerful bluetooth phone call function. 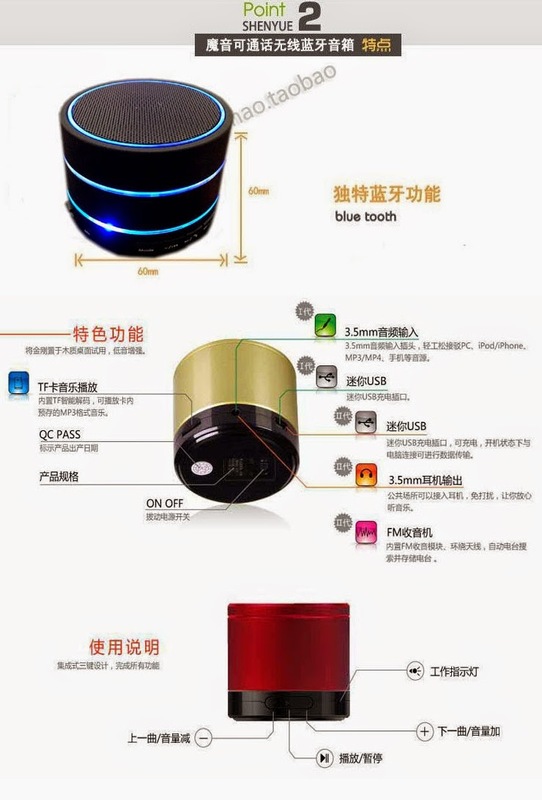 This speaker supports bluetooth connection it can connect to iphone, android, windows phone, blackberry and symbian. 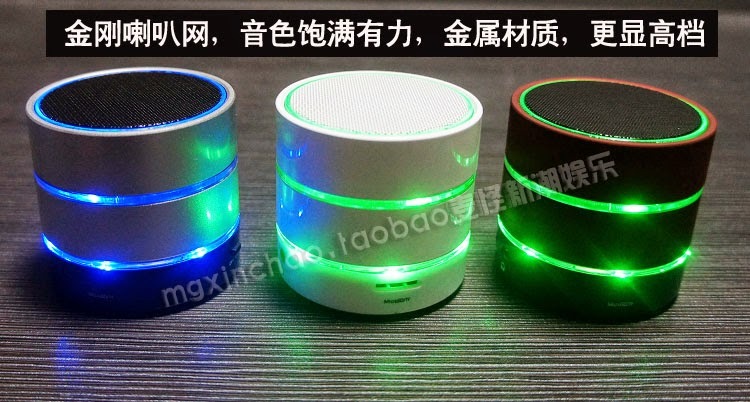 It supports bluetooth phone call it has built in microphone, it can open phone call conference. 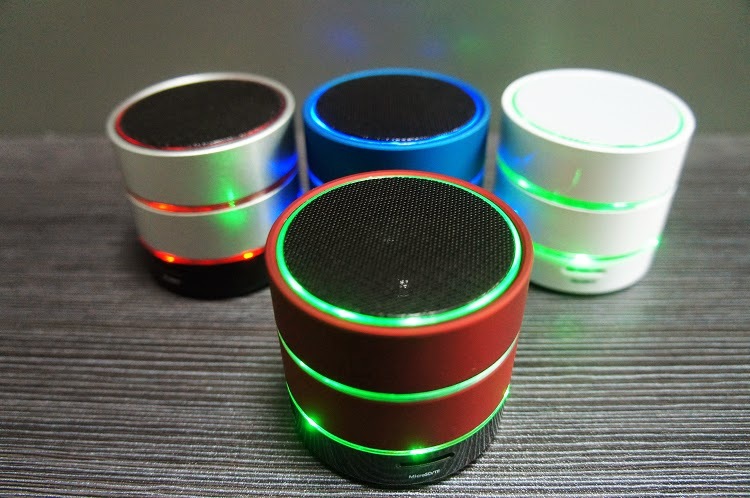 It supports 32gb memory card and MP3 files it also can be a traditional normal speaker connected by using cable. It has battery inside and u can recharge battery for many times. The packing is beautiful, suitable to be a gift. 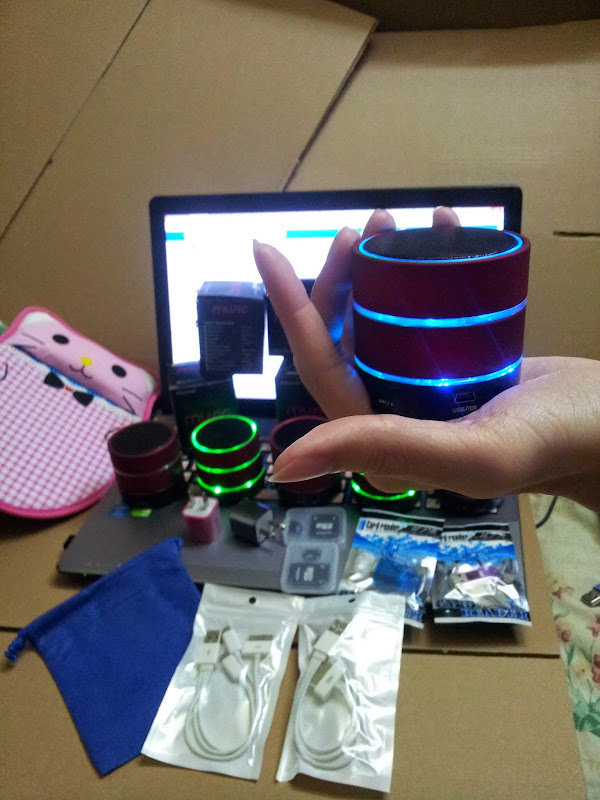 The size is small, so it is suitable for girl, it doesn't waste the space when putting it on table or bed. 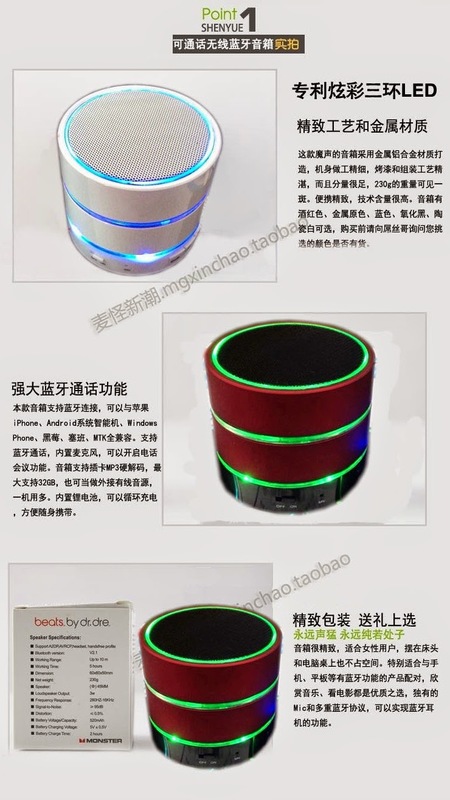 It is suitable connect to phone or any electronic devices which have bluetooth function to enjoy the music and movie. bluetooth : using CSR V2.1 bluetooth chip. It supports V2.0, V1.2, V1.1, support A2DP, AVRCP. 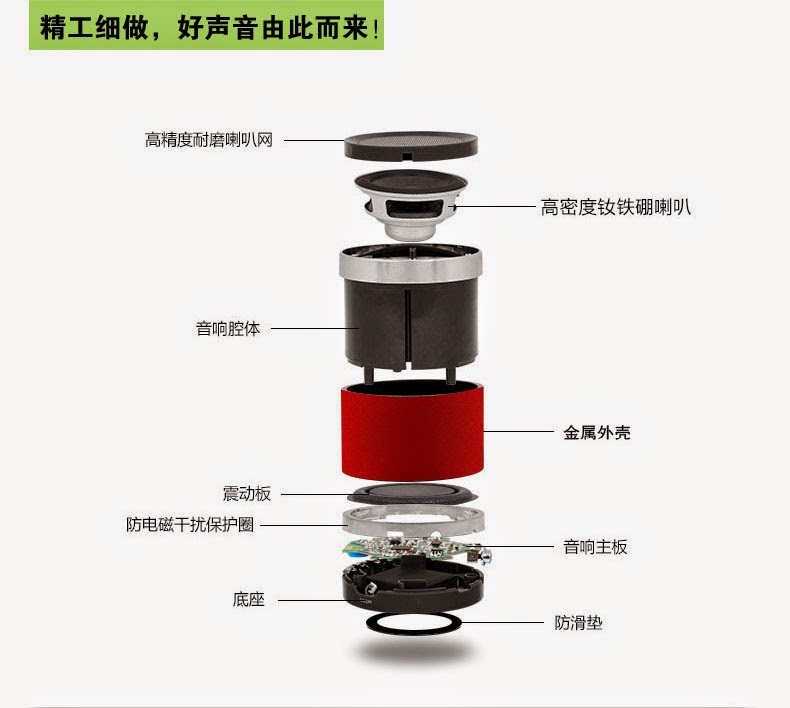 The size of speaker : 60MM*60MM*60MM. The weight of speaker : 230G. Speaker net long : 45MM. Charging time : 2 hours. Available colors: red, black, gray, white, blue. Standard accessories: battery charging and audio cable, manual, speakers body. 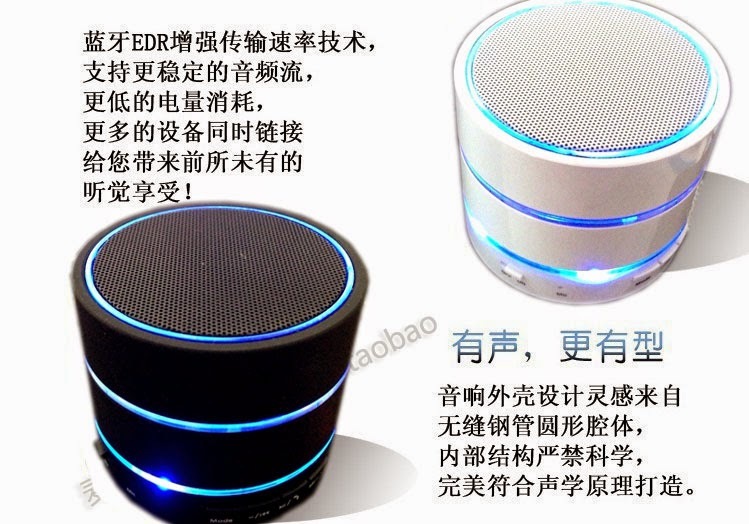 Bluetooth EDR technology enhances the transmission rate, the audio stream to support more stable, lower power consumption, more devices connected simultaneously to bring you an unprecedented listening experience. beautiful design, perfectly in design base on the principles of acoustics. 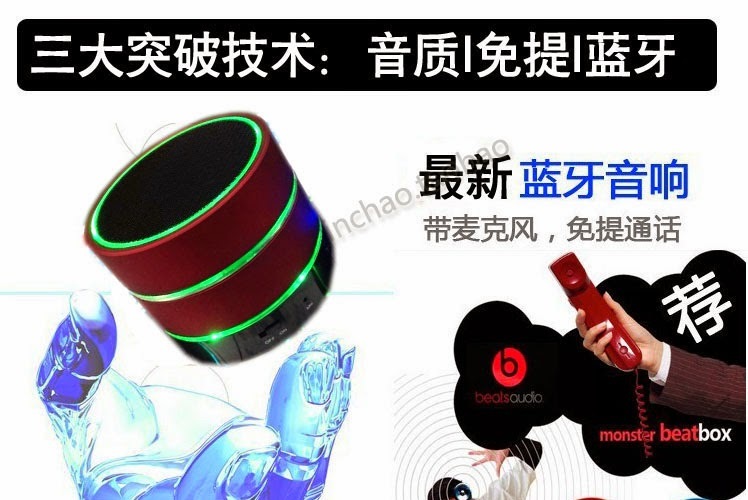 Support IPhone, Ipad, Android phones, computers and other equipment, listen to music, play games. Bluetooth wireless connection, S10 has a unique Bluetooth function within a certain range of Bluetooth audio player can receive outgoing audio signals. 1) First, pull the switch to the Bluetooth icon in the direction, and then turn on the phone or Bluetooth-enabled computer, start the search function. To the name of the search (S10). Then he can match with Bluetooth wireless connection up! 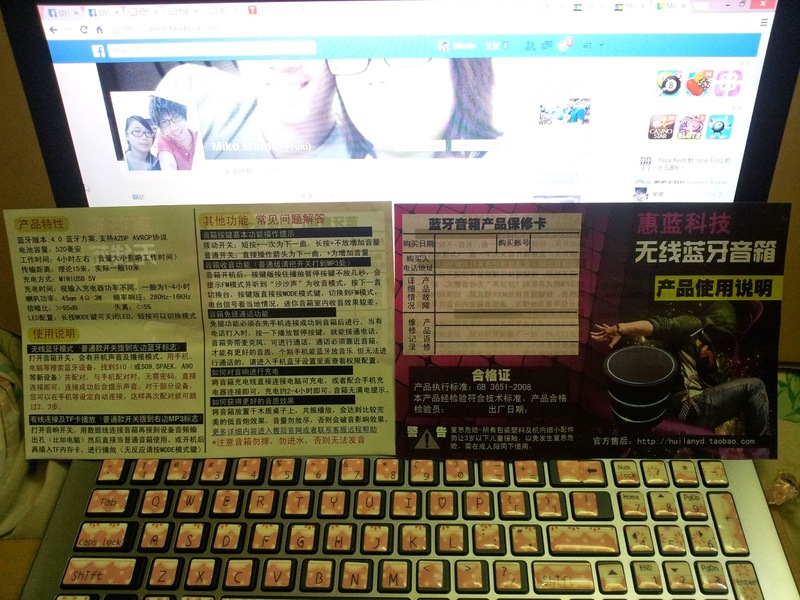 If you follow the first operation, no way to complete the search words! Please follow the instructions below! 2) then the sound off and then pull the switch to the Bluetooth standard orientation, and then click Pause. Re-search again using a mobile phone. In this case the name of the search (S10). Then he can match with wireless Bluetooth functionality! 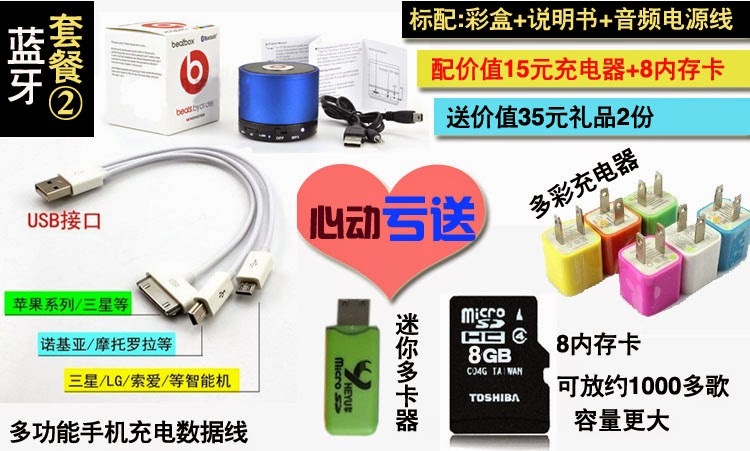 Come with charging USB and 3.5 plug double heads cable can connect to mobile phones, computers, cable connect to play music and charging the battery.